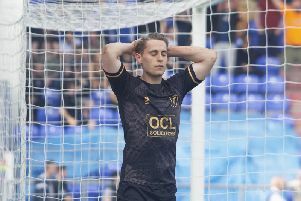 Saturday’s home capitulation against Crewe Alexandra has left Mansfield Town supporters fearful their side are going to throw away the chance of promotion for a second season in a row. All the hard work of a fantastic season suddenly threatens to be undone after an untimely run of four games without a win has seen them drop out of the top three automatic promotion spots and the pressure levels shoot through the roof with only seven games to go – four of them away. They say those who do not learn from history are condemned to repeat it, and last season was a bitter disappointment. But last season there were firm reasons for the side blowing up after manager Steve Evans abandoned ship with 12 games to go and left new boss David Flitcroft with little chance to get to know his players and what his best system to use them in would be. Those players have had to live with that failure for the past 12 months but have sparkled massively since and also been bolstered by better players joining them in one of the club’s best squads for many, many years. So what the hell has gone wrong? Fans have seen for the bulk of this season just how good this side is and just how well the systems Flitcroft has used have worked. Those players don’t become any less talented or committed overnight and the system doesn’t suddenly stop working. So are the players simply bottling it or are there deeper reasons? No team will have a perfect season and a bad run is inevitable. For Stags that saw poor displays at Notts County and Port Vale sandwich a home win over Forest Green. A point away at Crawley was not to be sniffed at, but a side going for the top three might have expected more. Nevertheless, it was an improved display and no one can have any criticism over Mansfield’s Monday night TV outing against leaders Lincoln City in which the Stags showed they can natch the best team in the league. But any thoughts that Stags had come out of that bad patch were rudely stomped on last weekend as they simply failed to perform at home against a Crewe side playing under no pressure at all. David Artell’s men arrived in mid-table in good form, knowing they were safe from relegation and have little more than a faint chance of gatecrashing the play-off party. But Mansfield had much, much more in their arsenal than they eventually brought to Saturday’s party. So where was it left? I do not believe for one second that any of those Stags players have suddenly stopped caring. So what is it? Has their confidence taken a huge knock since the Notts defeat in front of all those travelling fans? Have some of the players mentally questioned their own ability? Are some feeling the pressure more than they care to admit? Midfield veteran Neal Bishop, who has been there, seen it all and done it all before, is still firing on all cylinders and looks as determined to celebrate another promotion as ever. But other cogs in the machine around Bishop are misfiring and Flitcroft knows he has to get under the bonnet and do some urgent tinkering ahead of the weekend trip to Exeter City. The back three has been so rock solid all season that it’s a worry when a player of Krystian Pearce’s stature tries to over-play, slips and gifts Crewe their killer second goal on Saturday. CJ Hamilton tore the division apart pre-Christmas and looked every inch the million pound player he could have been in the January window. Fans were thankful he stayed but since then that sparkle seems to have been lost. Jacob Mellis looked a class above the division before the window, but his influence has faded since then and the confident passes he was spraying all over earlier in the season vastly reduced. Jorge Grant arrived from Forest on loan with a big reputation, forged in helping Notts County into last season’s play-offs, and he exploded onto the Stags scene in January with a string of high class man of the match displays. Opponents struggled to get anywhere near him and his clever tricks and flicks made matchday a pleasure to watch. But suddenly Grant is losing the ball too often, failing to carve out chances, and knows some fans want him dropped. All around the team performances are dropping from eight out of 10 to too many sixes. There have been other factors. Too many long term injuries to crucial players like Hayden White and Bobby Olejnik have not helped at all. The striker department has looked threadbare with the powerful option of Craig Davies out long term, last season’s top scorer Danny Rose sidelined for six weeks, loanee Nicky Ajose clearly short on full match sharpness and confidence and young prospect Jordan Graham also out injured. Tyler Walker has been largely left to shoulder the burden alone and done the club proud with his 21 goals. If the players around him had continued to provide the chances they were doing he might have hit more. Mansfield Town are a match for any side in the division this season but, with MK Dons overcoming a wobble of their own and Tranmere Rovers on an exceptional run of wins, the Stags need to rediscover their confidence and superior touch before it’s too late. Play-off chasing Exeter is far from the ideal place for that revival to begin on Saturday.